Impossible, or Just a Tough Decision? Impossible? …or Just a Tough Decision? We’ve all been there, haven’t we. We get stuck and convince ourselves it’s impossible. We don’t want to feel the negative emotions associated with any decision we might make, so we freeze up and say it can’t be done – and that’s understandable, really it is, it’s a defence mechanism. How many times have you been in what seems like an impossible situation and then later you find that it was, in fact, just a tough decision that you needed to make? When we do make decisions, we cut off all other choices or options – even the word comes from the Latin ‘decidere’ which means to cut off – and that can feel fearful. I know, I’ve been in that situation many times. The reality is it’s just a tough choice that I don’t want to make and am shying away from. Making that decision and bridging The Possibility Gap™ that lies between ‘problem’ and ‘solutions’ can move us on to a range of solutions that could all work. 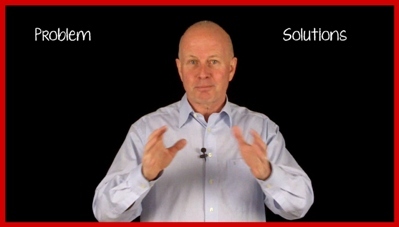 It’s funny, after producing this week’s show, I came across this very similar quote from Robert H. Schuller “Again and again, the impossible problem is solved when we see that the problem is only a tough decision waiting to be made.” It just goes to show, we don’t really need any new wisdom, we just need to DO something with what’s already available. The wisdom is there, it’s timeless – the understanding and integration of that wisdom is what will make a difference for us today. So whenever you hear yourself saying “It’s just impossible!” you might consider pausing for a moment and seeing if there’s actually a tough decision to be made – and that realisation might be all you need to get unstuck! I’d love to hear from you with your thoughts and comments on this episode. Have YOU put off difficult decisions and got stuck in The Possibility Gap™? Do leave your comments below, you never know who else you might be helping by sharing your thoughts. You’re going to LOVE this week’s episode then Melanie… could have been written just for you! Look out for the email Tuesday afternoon. it’s definitely something I’ll be keeping an eye out for from now on. I hadn’t even considered that my own prevarication on something challenging could really be a decision waiting to be made. Thanks Karl, really glad you got something from the story and video! Great blog you have there too Karl, enjoyed popping over, some really excellent stuff. Thanks for signing up and see you again soon!